IOCD was established in 1981 under the auspices of UNESCO, as the first international non-governmental organization (NGO) devoted to enhancing the role of the chemical sciences in development work and involving chemists in low- and middle-income countries (LMICs) — enabling them to contribute to key areas of science and technology for development. Today, IOCD remains the only international NGO with this focus and continues its mission through a variety of channels. Some examples are highlighted in the sections below. INFUSION Project: Engineering optoelectronic Interfaces: a global action intersecting fundamental concepts and technology implementation of self-organized organic materials. EU Marie Sk&lstrok;odowska-Curie ITN Action. For details, click here. PhotoTrain Project: Entrepreneuring dynamic self-organized interfaces in photocatalysis: a multidisciplinary training network converting light into products. EU Marie Sk&lstrok;odowska-Curie ITN Action. For details, click here. eScaled Project: European school on artificial leaf: electrodes & devices. EU Marie Sk&lstrok;odowska-Curie ITN Action. For details, click here. Coltan Project: Development of a local capacity for treatment of coltan ores in the Kivu provinces, DR Congo. Belgian Development for Cooperation research project. This project, 2019-2023, is lead by Professor Philippe Lambin, IOCD Treasurer, with IOCD as a technical advisor. The UN has designated 2019 as the International Year of the Periodic Table of the Chemical Elements (IYPTCE). This marks the 150th anniversary of the publication of the landmark Periodic Table by Russian chemist Dmitry Mendeleev. He organized the approximately 60 then known elements into a chart based on periodic trends in their properties, recognised that there were gaps and correctly predicted the existence of as yet undiscovered elements, including gallium, germanium, scandium and technetium. Subsequent work has demonstrated that Atomic Number is the underlying principle on which the elements in the Table are ordered. Advances in knowledge of atomic structure have explained the observed periodicity in properties in terms of the filling of atomic electron orbitals. The Table has thus become a bridge between observation and theory, guiding chemists in their understanding of chemical behaviour and driving new research into atomic structure. It also stimulated research to investigate elements formed by high-energy collisions between atoms – including the work by Glenn T. Seaborg, who was responsible for the identification and production of plutonium and discovery of nine additional elements, as well as for a major revision of the Periodic Table through his identification of the actinide concept. The Periodic Table can thus be seen as depicting the ‘Standard Model’ of chemistry as a science. A paper by IOCD's Executive Director Alain Krief and IOCD Secretary Stephen Matlin on Seaborg's work as a humanitarian scientists and promoter of global peace is being published in Nouvelle Chimie (currently in the press – look for its appearance in early 2019). Two papers by IOCD's action group, Chemists for Sustainability, are being published on aspects of the significance of the Periodic Table and emphasising what it teaches us about the limited stocks of the basic building blocks of matter. They convey messages about the importance of learning to conserve and husband the available supplies of less abundant elements and to avoid over-use and pollution in the exploitation of more abundant ones. The papers will be published during 2019 in the European Journal of Inorganic Chemistry and Current Science – watch for details. IOCD's prestigious series of International Conferences on Plant Chemistry was organised by the Working Group on Plant Chemistry every 1-2 years. The 15 symposia held 1996-2015 provided an important mechanism for plant chemists to share the latest results, including on the practical uses of plant products in medicine and other fields. In partnership with the Namur Research College (NARC), IOCD mounted a series of international symposia, in which leading chemists including Nobel Laureates presented the latest advances in research in the chemical sciences. To date there have been five of these Symposia. IOCD was a co-sponsor of the 23rd International Symposium on Pharmaceutical and Biomedical Analysis (23PBA), held in João Pessoa, Brazil, on 9-12 October 2011. IOCD Secretary Stephen Matlin gave a Keynote Lecture during 23PBA, on “Globalization and development: The critical role of pharmaceutical and biomedical analysis ”. Jean-Marie Lehn (Nobel Laureate; IOCD President) lectured at several international events in 2018, including the Third International Conference on Proteins and Peptides, Structure, Function and Biotechnology in Geneva on 23-26 July 2018, where he spoke about Towards Adaptive Chemistry, and the Curious 2018: Future Insight Conference, Darmstadt, 16-18 July 2018: where he gave a keynote presentation on Perspectives in chemistry – from supermolecular to adaptive chemistry. Peter Mahaffy and Stephen Matlin gave a joint Keynote Plenary presentation during the 25th International Conference on Chemistry Education in Sydney, Australia on 10-14 July 2018, on the topic Seeing the forest while in the trees: systems thinking in science education. The background to this work can be seen in the article in Nature Reviews Chemistry , here. Stephen Matlin gave the 2018 T. H. G. Jones Memorial Lecture in the School of Chemistry and Molecular Biosciences, University of Queensland, Brisbane, Australia on 15 July 2018 on The Chemical Sciences and a Sustainable Future. He delivered an additional seminar there the following day on the topic Chemistry and health: the need for a comprehensive approach. Text; Presentation. Jean-Marie Lehn spoke at a special seminar in the College of Engineering at Northeastern University, USA. His talk was entitled “Perspectives in Chemistry: From Supramolecular Towards Adaptive Chemistry – Pure and Applied”. He was the City University of Hong Kong, Institute for Advanced Study's Distinguished Lecturer during Nobel Week, speaking on “From Matter to Life: Chemistry? Chemistry!”, on 7 November 2017. Stephen Matlin participated in the annual meeting of IUPAC's Committee on Chemistry Education in São Paulo, Brazil, where he provided an update on IOCD's work in chemistry education; and he gave a presentation on IOCD's work on ‘one-world chemistry’ and the implications for chemistry education, during the concurrent 46th IUPAC World Chemistry Congress, 9-14 July 2017. On 15 March 2016, Nobel Laureate and IOCD President Jean-Marie Lehn was conferred with the title of Distinguished University Professor of Kyushu University, only the third person to be honoured this way, following Nobel Laureates Barry Sharpless and Muhammad Yunus. Lehn gave a lecture on the occasion, on his work on adaptive chemistry. During the year, Lehn also lectured at a number of other universities around the world, including at China Pharmaceutical University and Zhejiang University during a visit to China. Goverdhan Mehta was awarded Germany's prestigeous ‘Cross of the Order of Merit’ in 2016. An interview with him can be found here. Jean-Marie Lehn (Nobel Laureate; IOCD President) lectured at several universities in the Netherlands on 25-30 September 2015, and while in Nijmegen on 30 September was presented with the Netherlands Award for Supramolecular Chemistry in recognition of his lifetime contribution to the field of which he is considered the founding father. IOCD Executive Director Alain Krief attended the annual meeting of IUPAC's Committee on Chemistry Education in Busan, South Korea with the support of The French Community, Belgium and presented on IOCD's activities; and he gave a talk on IOCD's chemistry education work project during the concurrent IUPAC 45th World Chemistry Congress, 9-14 August 2015. Alain Krief participated in the launch of the Alliance for Accelerating Excellence in Science in Africa (AAESA) at the African Academy of Sciences (AAS) on 10 September 2015 in Nairobi, Kenya. IOCD collaborated with partners in a project to produce copies of the Ishango Bone for display as a symbol of early science in Africa. H.E. 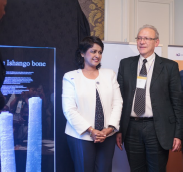 Dr. Ameenah Gurib-Fakim, President of the Republic of Mauritius, who is also a chemist, unveiled a replica of the Ishango Bone at the AAS headquarters during the AAESA launch. The 2015 Gordon Research Conference on Chemistry Education Research & Practice: Chemistry Education as an Agent in Global Progress took place at Bates College, Lewiston ME, USA on 21-26 June 2015. Stephen Matlin participated and gave a lecture on The Contribution of the Chemical Sciences to Global Progress: Achievements, Prospects and Challenges. Federico Rosei was presented with the World Cultural Council's 2014 José Vasconcelos World Award of Education at a ceremony in Finland on 17 November 2014 which was attended by IOCD's Executive Director. Prof. Rosei heads IOCD's Working Group on Materials for Energy Conversion, Saving and Storage (MATECSS). Stephen Matlin participated in the annual meeting of IUPAC's Committee on Chemistry Education in Toronto, Canada, where he provided an update on IOCD's activities; and he gave a presentation on IOCD's chemistry education work during the concurrent 23rd International Conference on Chemistry Education, 13-18 July 2014. Kurt Hostettmann (Chair of the former IOCD Working Group on Plant Chemistry) was presented on 1 September 2014 with the Egon-Stahl-Award in Gold on the occasion of the annual congress of the Society for Medicinal Plant and Natural Product Research held in Guimaraes, Portugal. The Award is the highest distinction of the Society and acknowledged Prof. Hostettmann's outstanding scientific lifetime work as a research scientist who has been closely involved with pharmacognosy and phytochemistry. The United Nations designated 2011 as the International Year of Chemistry (IYC2011), providing opportunities for a worldwide celebration of the achievements of chemistry and its contributions to the well-being of humankind. An initiative of the International Union of Pure and Applied Chemistry and UNESCO, the goals of IYC2011 were to increase the public appreciation of chemistry in meeting world needs, to encourage interest in chemistry among young people, and to generate enthusiasm for the creative future of chemistry. Learn more about IYC2011. 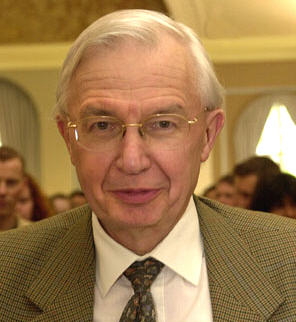 As a prominent chemist (Jean-Marie Lehn shared the 1987 Nobel Prize in Chemistry for development and use of molecules that recognize and interact with each other, a field now known as ‘supramolecular chemistry’), IOCD's President was very active in promoting the field of chemistry and celebrating its achievements in connection with IYC2011. Participating in the official launch ceremony of IYC2011 on 27-28 January in Paris at the headquarters of UNESCO, Professor Lehn gave the Introductory Lecture and framed the importance of the year in his talk, entitled “From Matter to Life: Chemistry!”. He observed that “The essence of chemistry is not just to discover but to create novel expressions of complex matters. The book of chemistry is not just to be read, it is to be written.” Read more about this event here and here. IOCD President Jean-Marie Lehn pictured during the official launch of the 2011 International Year of Chemistry at UNESCO, Paris on 27 January 2011. 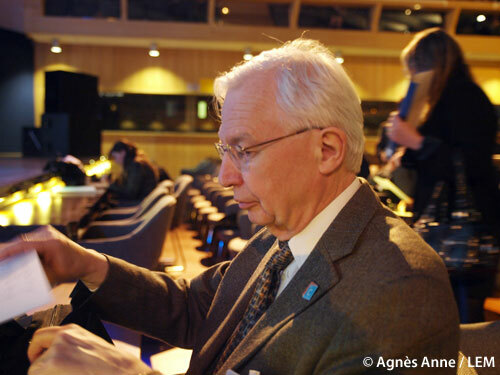 More on the official inauguration of IYC2011 and remarks by Jean-Marie Lehn on “Protecting our planet: the role of chemistry in creating a sustainable future” can be found here. In an interview with Nature, Professor Lehn spoke about the role of science in society and culture. Professor Lehn's comment “Chemistry will undoubtedly remain the central science in the 21st century” was featured at the front of the IYC2011 Media Kit of the International Union of Pure and Applied Chemistry. Writing on “Chemistry: The science and art of matter” in a special edition of the UNESCO Courier marking the start of IYC2011, IOCD's President Jean-Marie Lehn highlighted the pivotal role that chemistry has to play in relation to many aspects of human progress, including food and medicines, clothes and housing, energy and raw materials, transport and communications and much else. A paper by Professor Lehn on “Configurational and Constitutional Information Storage: Multiple Dynamics in Systems Based on Pyridyl and Acyl Hydrazones” was featured by Chemistry: A European Journal as part of its marking of the beginning of IYC2011. The book Concepts of Nanochemistry, co-authored by Ludovico Cademartiri, Geoffrey A. Ozin and Jean-Marie Lehn, was featured by the publishers Wiley as one of their Official International Year of Chemistry Publications. IOCD was enroled by its Executive Director, the distinguished Belgian chemist Professor Alain Krief of Namur University, in the IYC2011 Network. IOCD Senior Advisory Council member Berhanu Abegaz and Board member Stephen Matlin contributed a major review of “Chemistry for Development” in the book The Chemical Element: Chemistry's Contribution to Our Global Future, published by Wiley-VCH to mark IYC2011.